Boy, That’s a Lot of Butter! The museum's "American Enterprise" exhibition will mark 2018 as the year of the tractor. The oldest existing John Deere plow, a 1918 Waterloo Boy tractor, and a first generation GPS receiver. What do they have in common? They will all be seen by millions of visitors in 2018 during an exhibition at the Smithsonian’s National Museum of American History in Washington, D.C. This winter, the museum opens two new temporary exhibits as part of their “American Enterprise” exhibition. The exhibition chronicles the interaction between capitalism and democracy, and features the progress of American agriculture. The museum will mark the 100th anniversary of John Deere’s entry into the tractor market and the role that tractors continue to play in feeding a growing world. The exhibition will explore the massive change in farming practices brought about by the innovation of lightweight, mass-produced tractors. “We’re thrilled that the Smithsonian is using John Deere’s 100 years in the tractor business as a foundation to explore the broader theme of agricultural mechanization and its exciting future,” said Neil Dahlstrom, manager, Archives & History at John Deere. “As the entrance icon to the American Enterprise exhibit, the Waterloo Boy provides a rich story on innovation, production, and marketing success,” noted Peter Liebhold, curator, Division of Work and Labor, at the museum. Replacing a sleek, silver 1948 Tucker automobile at the entrance of the American Enterprise exhibit will be a 1918 Waterloo Boy Tractor owned by the museum. 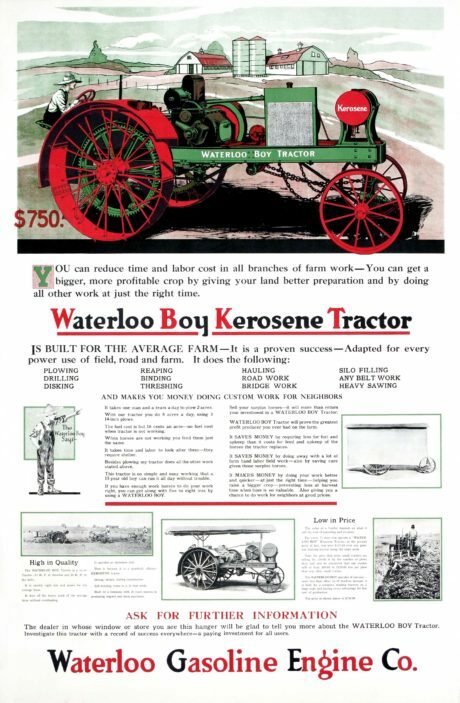 Displayed with historic images and advertisements, the Waterloo Boy represents a significant transition to mechanization, as farmers began to adopt one- and two-bottom tractor plows fueled by gasoline and kerosene after 1913. Ask a Farmer: The popular program will feature a conversation about past and present mechanization on the family farm with agricultural historians and farmers. Prototyping in 2018-Tractor History: A new hands-on activity exploring the history of tractors, developed with the Wonderplace early learning team, for children ages 0-6. Food History Weekend: As part of the fourth annual Food History Weekend on November 1-3, 2018, the museum will explore innovations in tractor history and agricultural mechanization. Within the American Enterprise exhibition, a new display titled “Precision Farming” will examine a more contemporary story of disruptive technology in today’s agriculture industry including a GPS antenna donated by John Deere. “The adoption of new technologies throughout the years, including tractors in the early 1900s and GPS today, illustrate American farmers’ ongoing willingness to improve efficiency and create more sustainable operations,” said Liebhold, curator, Division of Work and Labor, at the museum. The Precision Farming exhibit opens January 19 and the Waterloo Boy Tractor goes on view February 22. At the same time, the Smithsonian’s John Deere steel plow, the oldest known in existence, and dating back to 1838, will be on display from February to June 2018 at the Peoria Riverfront Museum in Peoria, Illinois. 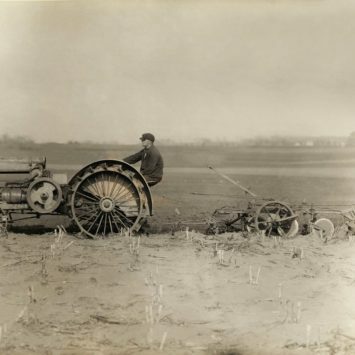 The plow is one of many artifacts featured in “Celebrate Illinois: 200 Years in the Land of Lincoln.” The Peoria Riverfront Museum exhibition will highlight the achievements of the people of Illinois, and is the first Illinois bicentennial exhibit hosted in the state. Check out 100 years of John Deere tractor history at the “American Enterprise” exhibition at the Smithsonian Institution in Washington, D.C. 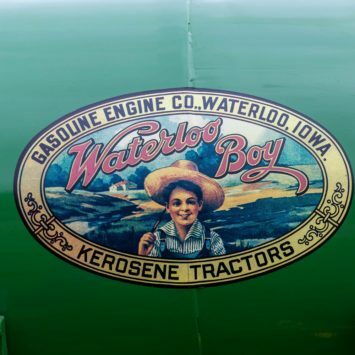 The iconic Waterloo Boy trademark as it appeared on the gas tank of the Waterloo Boy tractor. 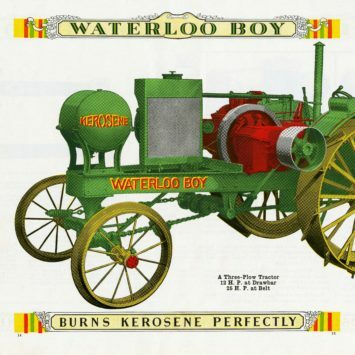 The Waterloo Boy was promoted as the "best and most efficient tractor" on the market for farmers inclined to buy a tractor. 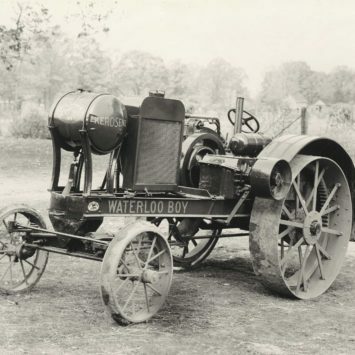 In 1920, the Waterloo Boy tractor included the John Deere leaping deer trademark on the front of the frame. 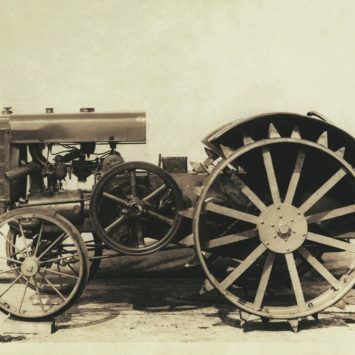 The "bathtub D" tractor was an experimental Waterloo Boy, which over time developed into the John Deere Model "D" tractor, introduced in 1923.